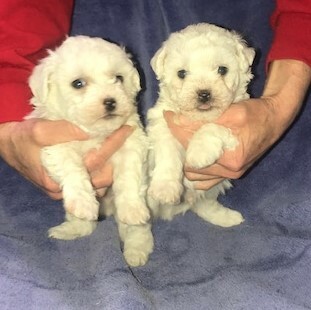 Pure-bred Bichon Frise - $900 each plus tax - CKC registered. Great breed for those who suffer from allergies. Also, check out our poodles. They are known to be good choices for allergy sufferers. Bichons are perky, bouncy, playful, and happy-go-lucky. They are very good with children and make wonderful family pets. They are very affectionate and require daily exercise. Their needs can be met with indoor play, a run around the yard, or a short walk. The Bichon needs to be brushed about every other day and does require grooming approximately every 6 weeks. Their life span is 12-15 years. 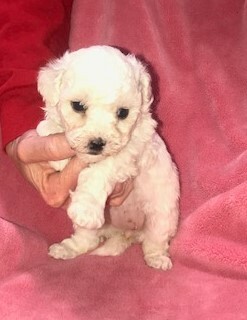 Our next litter of Bichon pups will be available on May 10. We have one female and two males that were born on 3-1-19. On May 17 a litter of four will be available. Three girls and a boy born on 3-7-19. Bichon is the mom and dad is the toy poodle.